Dal was a staple in our house when I was a child. Not different kinds of dal, but Toor dal (split pigeon peas) specifically. My mom made dal almost everyday, with white rice and a meat or vegetable to accompany it. Even when we had a meat curry main, there would always be some dal lurking around in the kitchen - we couldn’t escape it! Now dal is a comfort food for me, not for my husband or kids, but definitely for me. Because of my family’s aversion to dal and my recent mild intolerance to toor dal, I don’t get to eat it as often as I used to. But after some traveling, or even just a busy week when we’re forced to eat out for a few meals at a time, I love resetting with a meal of rice and dhal with a dollop of ghee on top! My mom’s dal is something I haven’t been able to recreate. The meat dishes, yes I do quite well making them, but this dal eludes me. And because my husband and kids throw a fuss when they see dal on the table, I haven’t taken the time to perfect her recipe. When I do make dal, I like it simple - with just the minimal amount of spices so that I can really enjoy the buttery flavor of cooked toor dal. As a child, I would eat the plain cooked dal until my mom took it away to add to her tarka! Heat the oil in another pot over medium to medium-high heat. Add the mustard seeds and curry leaves. When the mustard seeds start to splatter, add the cumin powder and hing and mix well. Add the coriander leaves, lime juice, and more salt as needed. Mix well and turn off the heat. Enjoy with rice, a dollop of ghee, and your favorite veggie or meat dish on the side! I only ever cook toor dal in a pressure cooker. A few years ago, when I was in between pressure cookers, I tried to make it on the stovetop and after over an hour of cooking, the lentils were still hard and raw. I did not have the patience to see it through, so I really don’t know how long toor dal takes to cook over the stovetop! If you don’t have a pressure cooker, try cooking the toor dal over the stovetop. You will need to soak the lentils overnight to soften them, and that also reduces the cook time. They will need to cook for about an hour, but don’t forget about them! The water will keep evaporating and the dal can burn, so you might need to keep adding water until it’s done. And if you decide you don’t want to wait an hour for toor dal to cook, you can substitute it with moong dal. The flavor of moong dal is a little different, but it only takes about 20-25 minutes to cook over the stovetop (without soaking). Let me know how it goes. 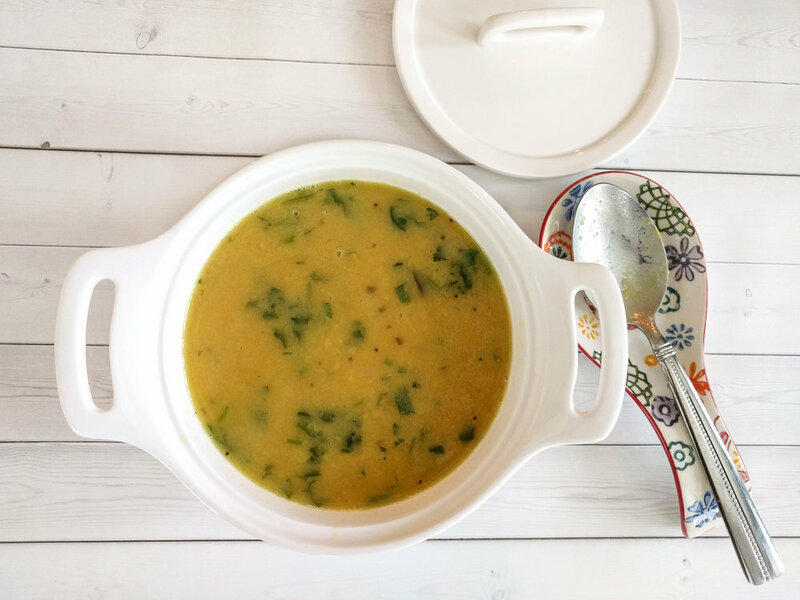 Toor dal is astringent, sweet, and heating, making it ideal for Vata and Kapha. It can aggravate Pitta so eat in moderation or substitute Toor for Moong dal. Hing (asafoetida), when added to lentils and beans, makes them more digestible and reduces gas and bloating caused by these foods.